Published: Sept. 25, 2012 at 02:12 p.m. Updated: Sept. 27, 2012 at 06:19 p.m.
You know it's an election year when the President of the United States is tweeting about the NFL's referee apocalypse. Obama's Twitter feed then pointed to a recent telephone interview with WTAM-AM in Cleveland, in which the POTUS pined for the return of locked-out officals. "But one thing I got to say, though, is it just me or do we have to get our regular refs back?" Obama asked WTAM's Bill Willis (via the Milwaukee Journal Sentinel). "I can't get involved with it, but I'm just expressing my point of view as a sports fan." 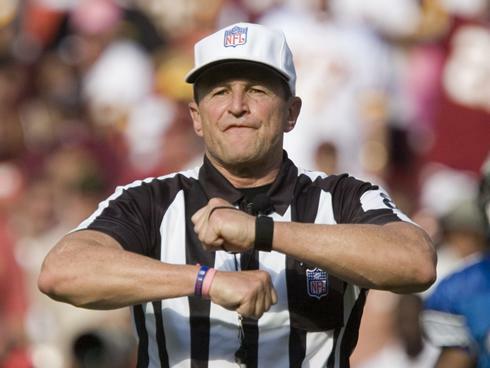 In a potentially related story, Mitt Romney has dropped Paul Ryan as his running mate in favor of Ed Hochuli.